The world third largest oil show is coming in the March in Beijing. China leading manufacturer GN Solids Control will come with its latest and advance design equipment. As requested by GN clients, GN Solids Control company will show its complete line mud solids control equipment and drilling waste management equipment. Clients can check all the equipment at site and face with GN engineering team face to face. When does 2016 Beijing oil show come? It comes at the end of March: 29th March 2016 to 31rst March 2016. It is also the spring time in Beijing, the weather is no cold no hot. It is the nice reason in Beijing. Where is 2016 Beijing oil show? The same with past years, 2016 Beijing oil show will be taken in New China International Exhibition Center, Beijing; No.88, Yuxiang Road, Tianzhu, Shunyi District, Beijing. 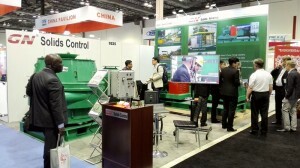 GN booth is in HALL E2 –E2200, the booth area is 272m2. Additional services: GN offers free shuttle bus for factory visit. GN Beijing factory is 40KM away from the Exhibition Center. After you check GN equipment in the oil show, if you have interest, you can pay a visit to GN factory to get more understanding of GN. What you can see from GN in 2016 Beijing oil show? 1) Solids control shale shaker: GN latest design 2-pane shale shaker, 3-panel shale shaker, 4-panel shale shaker, as well as double deck shale shaker. As the most advanced equipment of GN Solids Control, drilling waste management equipment is the high light of the oil show, most of GN drilling waste management equipment are available on the show.